SEBASTIA: Stuck between Israel and PA, key archaeological site neglected: Ancient Israelite capital Sebastia, site of important Roman and Crusader ruins, lies unprotected because of security situation (AP). IN HONOR OF PETER SCHÄFER: Konferenz am 2. und 3. Juli 2013: Judaism in Transition. Crossing Boundaries in Time and Space: From the Hellenistic-Roman World to Babylonia, from the Orient to Medieval Europe. THE WEEK'S DAF YOMI COLUMN BY ADAM KIRSCH IN TABLET: The Talmud Paints a Vivid Picture of Jewish Family Life in This Week’s Daf Yomi: Daf Yomi: Our literary critic discovers more rules on male authority, Shabbat meals, and how the rabbis thought about wealth. Earlier Daf Yomi columns are noted here and here and links. SOME LITTLE-KNOWN DEAD SEA SCROLLS LITIGATION: A Bit Of Ancient History Dead Sea Scrolls In Tax Court (Peter J Reilly, Forbes). In the future, planners would use the non-recognition of sales to grantor trust to great advantage in estate planning. Here it amounted to an income tax disaster. CONSTRUCTION: Bar Yochai Tomb in Meron Gets New Access Road (Arutz Sheva). Background on Rabbi Shimon Bar Yochai and his tomb is here and links. EDUCATION IN ISRAEL: Talmud studies to be offered to girls too: Education minister instructs state-religious schools in which half of parents wants daughters to study ancient rabbinic writings – to allow them to do so (Telem Yahav, Ynetnews.com). GOOD NEWS about both of my imminently forthcoming books. First, the final editing process for my translation of the Hekhalot literature is completed and the book has gone to the printer. It should be out, published by Brill, early next month. The Hekhalot literature is a motley collection of textually fluid and often textually corrupt documents in Hebrew and Aramaic which deal with mystical themes pertaining especially to God's throne-chariot (the Merkavah). They were composed between late antiquity and the early Middle Ages, with roots in earlier traditions and a long and complex subsequent history of transmission. This volume presents English translations of eclectic critical texts, with a full apparatus of variants, of most of the major Hekhalot documents: Hekhalot Rabbati; Sar Torah; Hekhalot Zutarti; Ma'aseh Merkavah; Merkavah Rabba; briefer macroforms: The Chapter of R. Nehuniah ben HaQanah, The Great Seal-Fearsome Crown, Sar Panim, The Ascent of Elijah ben Avuyah, and The Youth; and the Hekhalot fragments from the Cairo Geniza. Second, I have just received the page proofs for Old Testament Pseudepigrapha: More Noncanonical Scriptures, Volume 1, the firstfruits of The More Old Testament Pseudepigrapha Project. (If you are a contributor, the proofs for your contribution should be arriving soon.) The book should be out, published by Eerdmans, by the end of September at the latest. Old Testament Pseudepigrapha (OTP) (Volume 1) stands among the most important publications in biblical studies over the past twenty-five years. Intended to complement James Charlesworth's Old Testament Pseudepigrapha, this new two-volume collection adds a great many previously unpublished or newly translated texts. Providing the reader with virtually all known surviving pseudepigrapha written before the rise of Islam, OTP presents the sacred legends and spiritual reflections of numerous works that were lost, neglected, or suppressed for many centuries, with authoritative yet accessible introductions to each text. You can preorder the latter with Amazon at a substantial discount. For you, special deal! The corpus of Aramaic incantation bowls from Sasanian Mesopotamia is perhaps the most important source we have for studying the everyday beliefs and practices of the Jewish, Christian, Mandaean, Manichaean, Zoroastrian and Pagan communities on the eve of the Islamic conquests. The bowls are from the Schøyen Collection, which has some 650 texts in different varieties of Aramaic: Jewish Aramaic, Mandaic and Syriac, and forms the largest collection of its kind anywhere in the world. This volume presents editions of sixty-four Jewish Aramaic incantation bowls, with accompanying introductions, translations, philological notes, photographs and indices. The themes covered include the magical divorce and the accounts of the wonder-working sages Ḥanina ben Dosa and Joshua bar Peraḥia. It is the first of a multi-volume project that aims to publish the entire Schøyen Collection of Aramaic incantation bowls. Early this month, several prominent Israeli archaeologists were brought to inspect the site. Among them was Yosef Garfinkel, an archaeology professor from Hebrew University. There is no doubt the remains are those of monumental construction from the time of the First Temple, Garfinkel said. The top of the pillar, known as a capital, is of a type known as proto-aeolic, he said. That style dates to around 2,800 years ago. The pillar marks the entrance to a carved water tunnel reaching 250 yards underground, he said, complex construction that would almost certainly have been carried out by a central government. At the time, the area was ruled by Judean kings in nearby Jerusalem. In its scale and workmanship, Garfinkel said, the tunnel evokes another grand water project of First Temple times — the Siloam Tunnel in Jerusalem, now underneath the modern-day Arab neighborhood of Silwan. That project is believed to have been undertaken by the biblical king Hezekiah to channel water into the city ahead of an Assyrian siege in the 8th century BCE, according to an account in the biblical Book of Kings. The existence of a large water tunnel at the new site suggests the presence nearby of a large farm or palace, Garfinkel said. So according to Professor Garfinkel the architecture dates to the late Iron Age II but, contrary to the earlier reports, not to the Davidic or Solomonic eras. And it has parallels to the Siloam Tunnel. Wouldn't it be nice if it also had a dedication inscription in Hebrew, like the Siloam Tunnel? The aim of the project is to map the Jewish presence in the Byzantine empire using GIS (Geographical Information Systems). All information (published and unpublished) about the Jewish communities will be gathered and collated. Researchers and members of the public will be able to create maps according to their own specifications. Chronologically, the project will begin in 650. This is soon after the Arab conquest of Egypt, Palestine and Syria when these regions, with their substantial Jewish populations, were permanently separated from the Byzantine empire. The end-date is fixed by the arrival in the region of large numbers of Jewish immigrants from Spain in 1492. Geographically, the core areas of Asia Minor, the southern Balkans and the adjacent islands including Crete and Cyprus will be included for the entirety of the period, Byzantine Italy however, will only be covered down to the Norman conquest. Some smaller territories that were only briefly under Byzantine rule may be excluded. TurinOn the occasion of the completion of the KADMOS project (Kahle Documents Management, Organization and Study) and the 50th anniversary of Paul Ernst Kahle’s death, the University of Turin, Dipartimento di Studi Umanistici, is pleased to announce the conference “Archives of the Orient: International conference on Paul Ernst Kahle” that is scheduled for April 10th and 11th 2014 in Turin. The KADMOS project (2010-2013), realized with the contribution of Regione Piemonte, has allowed a series of activities on the archive, that is part of the Paul Kahle Fonds, aiming at making it available for research to the international scientific community. The conference will present the project and the goals achieved so far and intends to deepen the knowledge of the research fields addressed and investigated by Paul Ernst Kahle. Aim of the conference is to bring together academicians and scholars from various academic fields related to Oriental studies, in a cross-disciplinary panorama which mirrors Kahle’s manifold research interests, as well as archivists, curators and other professionals who work on research archives. - Archival aspects: experiences from archives that can be related to or compared with the Paul Kahle Fonds. Proposals must always highlight the connection of the proposed subject with Paul Ernst Kahle or the relevance for the management and enhancement of the Paul Kahle Fonds. Papers should be 20-25 minutes in length with 5-10 minutes for questions and discussion. The language of the conference is English. The deadline for submission of proposal is November 30, 2013; papers acceptance will be notified to authors by the end of January 2014. Conference proceedings will be published: authors will be asked to provide the full text of their paper before the conference. The English notice of the lecture is here [bad link now fixed!]. Background here (immediately preceding post). Prof. Elisha Qimron had been working on the final stages of the second volume of the new edition of the Hebrew writings of the Dead Sea Scrolls when a particular fragment of a Dead Sea Scroll had been posted on the joint website of Google and the Israel Antiquities Authority − the Leon Levy Dead Sea Scrolls Digital Library website. The website features very high resolution photographs of the Dead Sea Scrolls using a special camera, which not only records the condition of the actual scrolls to help preserve them, but also brings to light for the first time faded and hidden letters. The word “El” appears close to the phrase “tent of Shem,” and might indicate that the intent was to “Hashem” as a synonym for God. 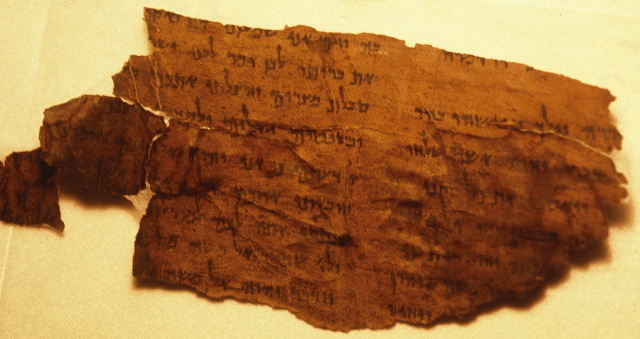 By comparing this text with another of the Dead Sea Scrolls, the scholars have come up with another interpretation. The scholars believe that the word “tent” can be interpreted as “land,” and that the text may mean that Hashem ‏(God‏) lives in the “land of Shem.” Thus, Canaan invaded a land that was not his, and that was the reason his descendants were exiled, not because of his father’s sin. This interpretation is also known from the Apocryphal Book of Jubilees, which survived in the Ethiopian sacred language of Gez and in Greek. There, it also states that Canaan’s sin was in taking the land in a manner different than the way Noah had intended to divide it, ignoring his brothers’ warning not to do so. “Whoever wrote this text knew this interpretation from the Book of Jubilees,” Ariel said. The conclusion is that this alternative tradition to the biblical version was common in the Judean Desert in Second Temple times and later disappeared. Disappointingly, the article does not say which Qumran fragment this is. I have seen some speculation on Facebook, but nothing I find persuasive yet. For more on the Google/Israel Museum Digital Dead Sea Scrolls Project and its efforts to recover lost text on the Scrolls, see here and links. Bit by bit, a letter at at time, whatever it takes. Until we're done. I've been saying that a lot lately, which I take to be a good sign. UPDATE: A number of people are suggesting that the text is 4Q180. I don't have time to verify for myself. UPDATE (4 June): Confirmed: it is 4Q180-4Q181. BOOK REVIEWS ARE NOW AVAILABLE AT: THE ENOCH SEMINAR ONLINE. COPTIC WATCH: James McGrath flags David Mihalyfy's new article "Re-Examining Spelling and Pronunciation in Coptic."